Yippee!!!!! The new Liberty Star pattern covers are going to press - this link takes you to a new photo album with all four covers. Finally finished up the projects and went to have photos taken last Monday at Color Inc (my VERY fine cover printer and photographer). . . eeeekkk my new idea for pattern covers was a mistake so Color Inc was very accommodating to fit me in for a re-shoot on Wednesday . . . yay these are very nice! Now it is full focus on writing the insides - directions and templates. We leave for quilt market a week from Tuesday . . . so the directions need to be at that printer on Monday - I guess they need a little time so they can print them and get them to the bindery for folding . . . nothing like being a day late - probably keeps my blood pressure at peak performance! Back to writing . . . I hope you will enjoy a peak the new covers. This is a better photo of Picking Cherries for Primitives of the Midwest in June and The Country Loft in August. No quilting yet but at least it does have the binding so it looks more finished. Visit my website Liberty Star to see it's brand new look - Jake did a quick revamp yesterday - he will be doing some more with it very soon. I will be updating the workshop schedule and adding some mixed media projects. 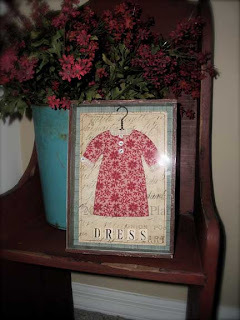 This is a project in the new pattern "Playing Dress Up" - it's really fun to make for those of you who like to play with paint and paper along with a little bit of sewing too. This is the "One Room Schoolhouse Journal" for Primitives of the Midwest . . . Clara the doll and last of the three projects is waiting for her clothes . . . such a patient little doll! Then those projects will be done - yippee! A little photography for kits and they can make their way to MO. That will be one more thing done on my rather long and overwhelming list of things to get done . . . 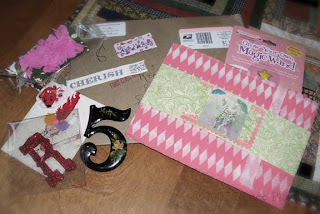 I sure don't enjoy being behind on deadlines.
. . . and all this fun stuff was a surprise from Tracy Roos in OR - SOOOOOO SWEET! Thank you Tracy . . . I love it all and will definitely try the magic wand tomorrow. Maybe a few waves of it over unfinished projects will magically finish them! Cross your fingers! This is a project for one of my workshops for Primitives of the Midwest at the Quilter's Station in Lee's Summit, MO - June 20 - 23. 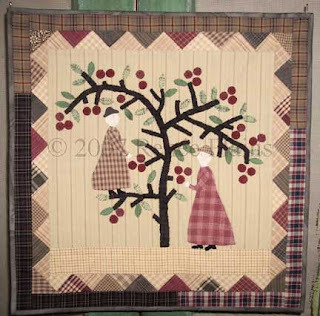 It is inspired from a vintage block that I have always thought was amusing - one lady in the tree and both of them in dresses working so hard. 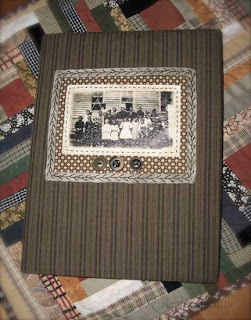 The two other projects One Room Schoolhouse Journal and a Primitive Doll, Clara aren't ready for photos yet but I am trying to get them done over the weekend. Then they will be off to MO . . . but not before I take some photos to post here. 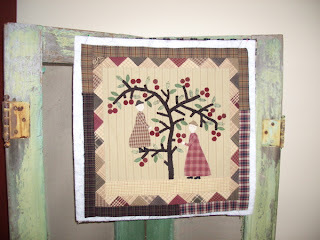 The Picking Cherries project will also be a workshop at the Country Loft in August along with a new primitive doll, Myrtle. Thank you so much for the very nice comments about the workshop and pattern projects - I really appreciate it. Several people have asked about workshop projects becoming patterns later . . . or being available as patterns - I usually don't publish them so that hopefully there will be interest in signing up for my workshops. Back to stitching - so much to do . . . so little time!